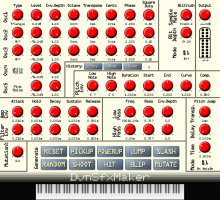 After a seven year break from plugin development, Verklagekasper (formerly known as Moppel) has released version 1.3 of Sonitarium, a synth employing up to 200 aliasing-free DSF-oscillators per voice to create fat pads, drones sounds, and horror music. The 68-generation wanted to make a revolution. Now they are 68 and say: Oh, why haven't we started a revolution instead of happenings. Die 68er-Generation wollte Revolution machen. Heute sind sie 68 und sagen: Ach, hätten wir damals Revolution statt Happenings gemacht. Davi Santos has announced the release of the DvnSfxMaker, DvnKeyFilter and DvnBitcrusher for Windows and OS X (32 and 64-bits are available): DvnSfxMaker is virtual instrument to create sound effects using random generators. DvnKeyFilter is low pass filter with the cutoff frequency controlled by key tracking and a second parameter. DvnBitCrusher is a simple bit crusher effect.